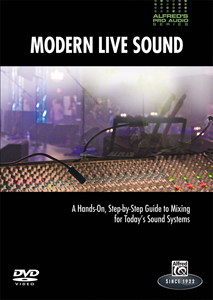 Alfred Music Publishing's new DVD, Modern Live Sound, is a practical, step-by-step guide to mixing for today’s sound reinforcement engineer. Modern Live Sound offers a hands-on approach to learning the art of sound mixing, a must-have for anyone entering, or re-entering the world of live sound. Whether mixing sound for a small local club, touring for the first time with a band, or considering a full-time career as a live sound engineer, this video will brings viewers up to speed with today's live sound reinforcement systems.